Leather are materials made from the skin of an animal ordinarily by tanning and drying the skin to produce leather. Leather types of furniture or chairs made of this strong material normally have long-term durability. Materials made from leather clothing are considered to be genuine in texture and quality. Leathers can be used for chairs upholstery, shoe bags etc. One can notice have noticed the difference or pleasure you derive when seated on a leather chair, and the respect it preserves in homes that give families comfort after a busy day. The comfort you derived when you furnish your home with leather chairs is quite enormous with the range of beautiful design suit your status. The most beautiful characteristic of leather is mainly the flexible, versatility, and durability it provides. Nevertheless, the materials come in different types in texture and durability. The full-grain leather comprises a smooth outermost layer of a cowhide, with a material called the split, which contains a fibrous, and soft second layer below the first. Having this composition and texture, the full grain leather is extremely durable, stiff, and breathable which adds to its longevity attributes and limits moisture absorption. When purchasing pieces of furniture like sofas, office chairs and ottoman, you should consider using the full grain leather furniture. This furniture can stand up to any external defects well to wear and tear, which smoothens and soften the leather texture. Therefore when contemplating using a natural texture in your decoration the full grain will serve just the purpose. The top leather furniture comes from a smooth outermost layer of the cowhide which is also durable and excellent when used for upholstery. Unlike the full grain leather furniture, it doesn’t leave the second layer of split leather attached on the underside. Top grain leather is thick and can withstand pressure usually fit for game rooms and playroom especially children rooms due to the fact that it’s easy to wipe clean and resist stains. The split leather is usually the lower layer that is left after top grain cowhide layer is been removed from the two full grain layers. Split leather has a naturally soft, downy nap, which out of the material the suede is made from. Split leather is beautiful in looks and cannot necessarily be compared with top or full grain leather due to the thin materials is made out from. Bonded leather is another fine upholstery material, not crafted from full cowhide unlike the other leather types, it is a collection of leather scraps that are compounded together with an adhesive and compressed together into a large sheet. The leather is heated during the composition process which allows manufacturers to add patterns to the unique textures. which is thinner from the other types of leathers due to the constructions is coated out from. The leather finishes involve the various types of leather you come across when purchasing leather furniture, comprising of various treatments applied to the material to give it color and equally maintain its texture. 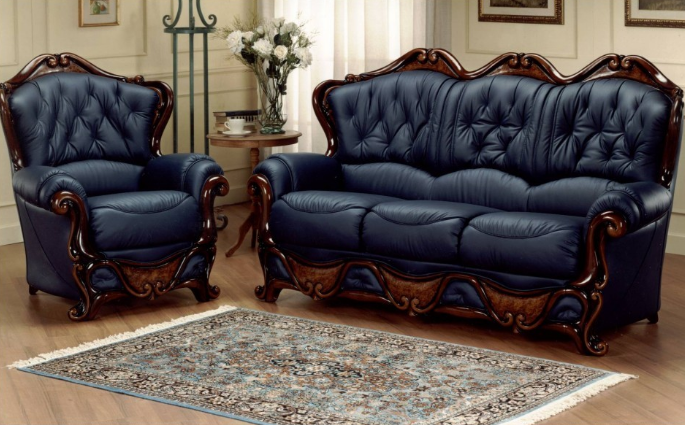 Conclusively, one should seek assistance when shopping for leather furniture products in other to distinguish among the different types available in the market.